The Knotwell Family Blog: Did you ever think it would happen again? I will admit to being one of those naysayers who said as little as 5 months ago that we could kiss $2 per gallon gas goodbye... but I am happy to eat crow on this one. 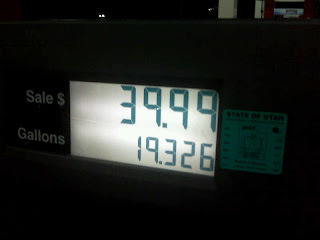 We filled up the mini van for under $40 tonight... because gas was down to $1.99. I only wish it was this low when we drove to Missouri this past April, $80 to fill up the tank... 6 times... do the math on that one! Oil traded for $56 a barrel today, lowest in 21 months, Yippee, Skippy! K, seriously, I am at the computer too much. I can't believe it either. I filled my porche up today and it was only $28. Now that is awesome. I'm comin over to pick you guys up. Ours is currently at $1.79...filled up the truck for under $30.00 the other day! Yowza! Isn't it awesome!!! Finally a break with something!